In light of the yuan devaluation fireworks and the dire state of Chinese companies, Chinese local governments haven’t gotten a lot of headlines recently. Now we know why. 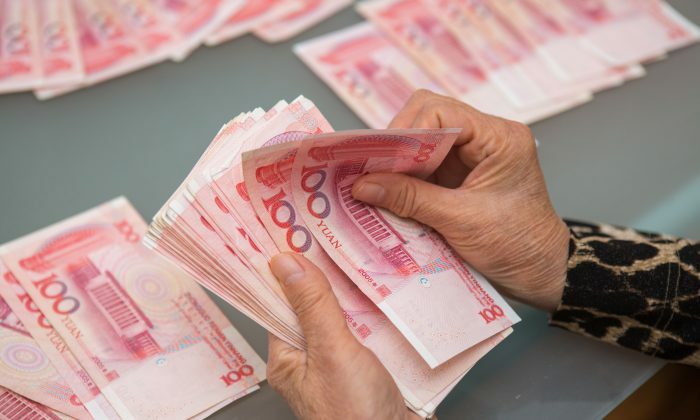 As Chiecon reports, China’s local government debt increased 41.54 percent in 2014, according to data compiled by the 21st Century Business Herald and released on Dec. 3. Local debt data takes a long time to compile, so the finance ministry may have felt the need to act on the year-old data immediately and expand the limit. The debt swap program simply allows local governments—indebted to the tune of 24 trillion yuan—to swap higher interest bank loans to lower interest bonds. The bonds are also bought by the same banks, but can then be posted as collateral with the central bank, easing their financing constraints. This exercise not only lowers interest payments of the local governments, but also gives banks the opportunity to pass on the debt to the central bank, easing pressure on their balance sheet. By buying local government debt from banks and other financial institutions, the central bank replenishes their reserves and they could start lending to local governments again. Despite a high chance of this money being wasted, it would still go into the economy at first and probably benefit real estate as well. In addition, the central government can exert more control over local governments. The local governments desperately need the fresh money, because revenues from land sales have declined along with the slowing economy. According to the report by Chiecon, local governments are hitting centrally imposed debt limits and can’t borrow more. 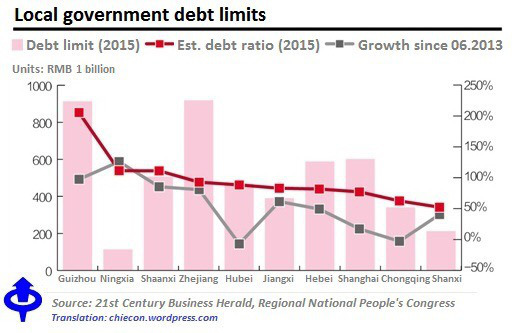 In the chart below, Guizhou for example has a debt limit of 900 billion yuan. The red line represents the assets the local government has securing the debt in relation of the debt limit. In Guizhou’s case, the debt limit is 200 percent of available assets and Chiecon notes it’s very likely the provinces are actually at their limit, if not above. Because the debt swap program only lowers interest expense and doesn’t cancel the debt (at least for now), provinces will have very little financial fire power in the near future.